An Aberdeenshire ranger is speaking out about the dangers of balloon releases after finding another bunch entangled at a nature reserve. A council ranger has spoken out about the dangers of balloons and the damage they can cause to wildlife. 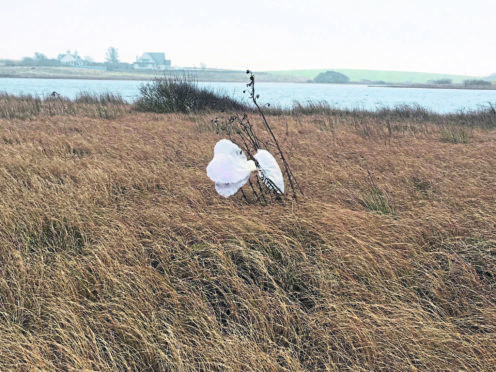 Sarah Gosden was recently out walking her dog at the Sand Loch at Forvie National Nature Reserve when she noticed a bunch of birthday balloons tangled up in plants. She collected the remnants of rubber and put them safely in the bin at home to help protect the environment. The Aberdeenshire Council Buchan ranger now hopes that by spreading awareness of the hazards involved less people will set them free in the air for celebrations. Ms Gosden said: “Balloons can be a choking hazard for wildlife and livestock. “Sea creatures which feed on jellyfish commonly confuse floating balloons as food and it then chokes them. “The same happens with livestock. “A horse that recently tried to eat a balloon, then couldn’t breathe, got scared and had to be put down. “There was also a successful case a few years back when a farmer managed to sue after balloons were released at a charity event which killed his cows and calves. “Even if it isn’t eaten by them, it can land in a field and eventually be ground up and accidentally end up in silage and in their feed. “Helium is also a finite resource used for advanced medical and technical equipment. Ms Gosden takes part in beach cleans and other events helping to tidy up the countryside where parts of balloons are regularly unearthed. Aberdeenshire Council and many other local authorities now have policies banning the release of balloons and sky lanterns from its properties and land. Ms Gosden also spoke out to warn about so-called biodegradable balloons. She said: “They may say that on the label but to biodegrade they have to land somewhere first so they’re just as bad as the mylar foil covered plastic ones. “Letting them go is like sending a plastic bag into the sky. “People shouldn’t walk past litter. “You don’t have to be part of a huge operation to make a difference.